Aspirants who are eager to participate in HP Off Campus 2018 Drive For Freshers are at the right place to get complete information. The current article will guide the candidates with all the necessary support. Getting placement as freshers in HP Company is a golden opportunity for all the passed out candidates. In this drive, HP is hiring Fresher Graduates and Post Graduates from all over the country. Interested participants were suggested to go through the complete article to get more details about the recruitment drive. We strive our level best in order to make the information more clear for the applicants. At the time of applying use the registration link provided in the below section. Bookmark us so that you can visit us and can make a check over the details like eligibility Criteria, Salary, Selection process etc details at any time you prefer. HP Off Campus 2018 Drive is a huge opportunity for most of the job hunters in the current market. 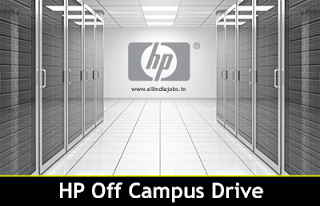 Every year HP company organizes Off campus drives at several colleges in order to find capable candidates for the available vacancies. Many candidates are watching closely so as to utilize the opportunity and to get placed. The applicants must have to get prepared for the written test and Interview as the competition was huge. Performance of the aspirants in this rounds decides their eligibility into further rounds of selecting. So candidates must have to make preparation hard in order to get selected. For enhancing aspirants preparation we have equipped some HP Placement Papers and HP Interview Questions. In addition to this check, HP Syllabus and HP Test Pattern can be viewed from our site www.allindiajobs.in. HP Off Campus table will help the candidates to come aware of all the information within a short span of time. Candidates possessing anyone one of the qualifications specified in the below are eligible to apply for HP Off Campus Drive. B. Pharm, B.A, B.Com, B.E-Com, B.Sc, B.Tech, BAF, BBA, BBI, BBM, BBS, BCA, BCM, BDS, BFIA, BFM, BIM, BIT, BJMC, BMM, BMS, Chartered Accountant, Diploma 1 Yr, Diploma 2 Yr, Diploma 3 Yr. Applicant must maintain consistent academic background from 10th Standard onwards. Must obtain 60% at each level of qualification. Candidates handling backlogs at the time of applying for HP Off Campus are not eligible to apply. Make sure to complete them prior to the Off Campus Drive. Must possess excellent written and verbal communication skills. Excellent fluency in the language to be supported. Open the Apply Here link provided in the below. Check the entire form clearly and be sure to be available with all the details. Enter the details in the specified fields and submit the application. Make a hardcopy of the application filled details. Applicants hired in HP Off Campus Drive as a fresher will be provided with a pay scale of Rs.3.18 lakhs to Rs.3.30 lakhs per annum. Must carry a valid ID Proof. Original Certificates for SSC onwards. A couple of Passport Size Photos. Check the following instructions as they are helpful for the candidates to crack HP Off Campus Drive. With proper preparation, you can easily get qualified over the rounds of selection in HP Off Camus Drive. For freshers, this is a golden opportunity for applying for and building up their career. Check Latest HP Syllabus and HP Test Pattern. Organize several Practice sessions over HP placement Papers. Must possess good communication skills. Refer basics of subjects in Graduation or Post Graduation. Be confident and attentive while attending the Interview. Go through all HR Interview and Questions. Listen carefully and answer the questions. Hope the information provided about HP off campus drive 2018 was helpful for all the job hunters while seeking their career as freshers. All the best for the applicants for their bright future. For latest job offerings in current market visit All India Jobs. Bookmark us so that you can visit us directly. Thank You.